This week’s Write the Book Prompt is inspired by the lives of two men born on this date: martial artist and actor Bruce Lee, born November 27, 1940, and American rock guitarist, singer, and songwriter Jimi Hendrix, born November 27, 1942. Both men had ties to Seattle. Hendrix was born there. Lee moved there to attend college and later opened a martial arts school there. Both men struggled to achieve success in their fields, and each finally achieved it before dying young, eventually becoming a legend in his respective field. This week, consider these men and their lives and careers. Consider their fortunes, good and bad, their determination and talent. And then either write about them, or allow their stories to inform the work that you’re doing. Graphic Novelist Brian David Johnson, author of MWD: Hell Is Coming Home (Candlewick). Brian David Johnson suggested a great Write the Book Prompt from his work in business journalism. Go to a Walmart or a hardware store, pick up any obscure part or item, look at where it is from, and then research that town; try to come up with a story that has to do with that place. Thirteen-year-old novelist Emily Rose Ross, the youngest author I've ever interviewed (and the youngest author ever to be signed by her publisher). Her debut novel is Blue's Prophecy (Title Town). This week’s Write the Book Prompt was generously suggested by our guest, Emily Rose Ross. When Emily and Diane were half way through the editing process, they decided it would be a good idea to lay out the story of Blue’s Prophecy in such a way that the book’s motive and their goals were always visible to them. They went to Home Depot and bought a huge strip of landscaping paper. They hung it on the wall in such a way that, standing on chairs, they could write down information about individual chapters, about characters, about maps and other details. The paper kept them organized and helped them find the story arc. Emily says it helped them a lot. Her suggestion is that listeners who write do a similar thing with paper, or a whiteboard, possibly a bulletin board. I’ve also heard of writers who like to use sticky notes on a wall. All of which offers a unique new way to see your work and possibly help you plan next steps, solve problems, and stay organized. Julie Barton, author of the new memoir Dog Medicine (Think Piece). 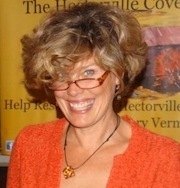 Author, playwright and activist Diane Lefer, whose new book is Confessions of a Carnivore, published by Burlington, VT publisher, Fomite Press. Visit Second Chances LA to read Diane's interviews with torture victims in her local (Los Angeles) community. This week’s Write The Book Prompt was suggested by my guest, Diane Lefer, who says that writers sometimes forget to consider what their characters want at different points in their fictional lives. She likes to present a character’s emotional life, and not just the facts. The prompt, then, is to write, “When I was five years old, what I wanted more than anything else in the world was…” and finish that statement. Write it again, beginning, “When I was ten years old,” and “When I was fifteen years old.” Keep going with this. Choose the intervals of time that make the most sense for your age or for that of your character. See how the desire changes, and keep that in mind as you write. 2010 interview with Unitarian minister and author Gary Kowalski. We spoke about his book Revolutionary Spirits: The Enlightened Faith of America's Founding Fathers. In 2013, I interviewed the reverend Kowalski a second time, about his book, Goodbye Friend. “I can shake off everything as I write; my sorrows disappear, my courage is reborn." John Homans, author of the new book, What's A Dog For? , published by Penguin, and executive editor of New York Magazine. From Anton Chekhov's Lady With Lap Dog to Jack London's Call of the Wild, dogs, of course, feature prominently in literature. This week it's your turn to add to the canon; the Write The Book Prompt is to write about an unexpected encounter with a dog. NOTE: Check out the guidelines for submitting your writing prompt outcomes for possible inclusion on the show!